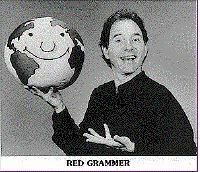 Red Grammer was the tenor for the Limeliters for over a decade (approximately 1981-1991). He wrote the wonderful song "Harmony" that is on The Limeliters' albums Harmony and Alive! In Concert. Red performed at many concerts and on many other Limeliters albums during this period, including Singing for the Fun, Potpourri and A Mighty Day!. Red was born in 1952, in East Orange, New Jersey. Red says that "although I always enjoyed playing the drums and 'singing along' to the records of Johnny Mathis, Peter Paul and Mary, and the Beatles, I resolved to enter Pre Med studies at Rutgers University. But the lure of music was overwhelming. I change my major to music, transferred to Beloit College in Wisconsin, and received my B.A. in music there in 1975. Music has been my life ever since." Red met his wife and co-lyricist, Kathy, a special education teacher, at Beloit College. He now lives in Ojai, California. Red has released two solo albums for adults. The first, 1993's Free Falling features nine original songs, plus two of Red's personal favorites by Dan Fogelberg and by Don Lange. The selections on this album are a mix of jazz, pop, and mellow sounds, quite different from the folk style of the Limeliters as well as his children's music. His second album for adults is Soul Man in a Techno World, released in 2001,engages a soulful folk style, and includes: Wings We Can Fly On, Till Then, You Think I,m Crazy, Flight, Soulman in a Techno World, Raindrops from Heaven, Flyin' Blind, Strangely Wrapped Gift, Man Who Stands in the Shadow, It's Gonna Be Alright and Love is Atomic.